Wormwood leaf has been used as a powerful tool to fight worms, most notably, eliminate pinworms and roundworms and other parasitic infestations in humans and animals. It has long been used as an anthelmintic that expels intestinal worms and research has indicated that because of the increasing resistance to parasites, the compounds contained in this herb are now relied on greatly to treat malaria. It has been used to treat migraines headaches and as a digestive that improves the appetite and relieves digestive disturbances. When applied topically it aids in healing wounds, blemishes, skin ulcers and insect bites. Wormwood aids in secretions of the gallbladder and liver and is an old and trusted remedy for biliousness and liver troubles, jaundice and gallbladder ailments. Wormwood, a nervine tonic, it nourishes the nervous system easing stress and nervous disorders. When used as an herbal tranquilizer, it helps calm and soothe the nerves and reduces tension and anxiety. The herb's absinthin content is a narcotic analgesic that affects the medullary portion of the brain concerned with anxiety and is said to induce a relaxed state. It is also said to be helpful for liver and gallbladder secretions. Soothes gastric pain and stomach acidity. Also helps with fevers, colds, jaundice, circulation, and rheumatism. Wormwood has also been used medicinally as a mild sedative that affects the portion of the brain dealing with pain aiding in the relief of migraine headaches, nervous diseases and is very soothing for nervous temperament. Wormwood tea has been recommended to help relieve the pain of labor. When applied externally to the skin it relieves the pain of sprains, bruises, and irritations of the skin. It acts as a local anesthetic when applied to relieve pains of rheumatism, neuralgia, and arthritis. 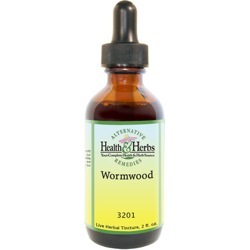 Wormwood is a cardiac stimulant and therefore acts, when taken in the proper dosage, to improve circulation. Traditionally, herbalists claim that Wormwood lowers intermittent fevers and fights infection. Because it increases stomach acidity, it aids in the whole digestive process. It has been used to help alleviate gastritis, stomachache, bloating and flatulence. As a bitter, aromatic herb, Wormwood is also said to improve a poor appetite. Wormwood has been effective as a uterine stimulant that is said to help regulate irregular menstrual cycles (this herb should not be used by pregnant women). Applied topically, the oil extracted from Wormwood acts as an anti-inflammatory that is used as a liniment to relieve pain and sore muscles. It is useful for healing wounds, skin ulcers, blemishes and insect bites. Wormwood may also be used as an organic insect repellent when sprayed on organic gardens or when prepared as a sachet to keep moths from clothing. Ingredients: Wormwood, Structured Water, 20% Alcohol. Non-Alcohol: Wormwood, Structured Water, Vegetable Glycerin. From Anonymous of Palm Coast, Florida on 9/29/2013 .